Aqua fortis; Azotic acid; Engraver’s acid; Hydrogen nitrate. 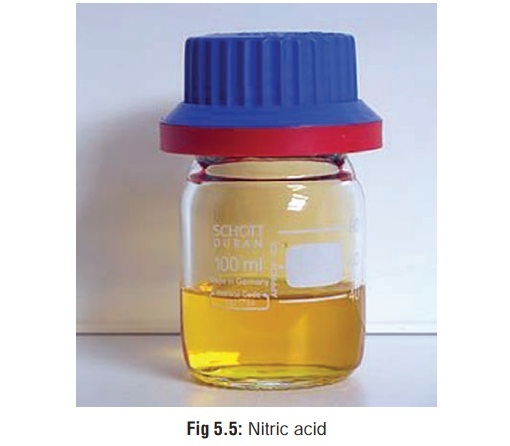 Nitric acid is a colourless or yellowish fuming liquid (Fig5.5) with an acrid, penetrating odour. It is essentially asolution of nitrogen dioxide (NO2) in water and is available commercially in several forms. Nitric acid releases oxides of nitrogen into the air upon exposure to light. Therefore exposure to nitric acid poten-tially involves exposure to oxides of nitrogen, especially nitrogen dioxide. Nitric acid is formed in photochemical smog from the reaction between nitric oxide and hydrocarbons. Individuals living in heavily polluted areas may receive chronic inhalation exposure to nitric acid. Workers in the following professions may be exposed to nitrogen oxides or nitric acid: glassblowing, engraving and electroplating, underground blasting operations, farming (silage and fertilisers), welding, fire fighting, and industrial chemistry. About 20 to 30 ml. Nitric acid is a powerful oxidising agent and reacts with organic matter to produce trinitrophenol, liberating nitrogen monoxide (xanthoproteic reaction). Corrosion is less severe when compared to sulfuric acid. · Corroded areas appear yellowish due to xanthoproteic reaction (Fig 5.6). Stains on clothing and teeth also appear yellowish. · More severe eructation and abdominal distension due to gas formation. · Perforation of GI tract is less common. · Inhalation of fumes can produce coughing, rhinorrhoea, lacrimation, dyspnoea, and pulmonary oedema. · Drop a small piece of copper into the stomach contents and heat it. Pungent, dark brown heavy fumes will emanate if nitric acid is present in sufficient concentration. Same as for sulfuric acid. Respiratory distress is present more often and requires special attention. · Corroded areas of skin, teeth, and mucous membranes appear yellowish. Stains on clothing also show yellowish discol-ouration. · Gastrointestinal perforation is less common. Same as for sulfuric acid. Mistaking it for glycerine or castor oil, however is rare because it is a fuming liquid.